The Scythians were a group of ancient tribes of warriors who originally lived in the steppes to the north of the Black Sea, in what is now southern Siberia. They were cattle-breeding nomads, meaning that they did not stay in the same place for long. When cattle ate out all the grass around, they travelled to a different place, where the grass was fresh and untouched. They were also skilled horsemen and brave warriors. They were the first who used light cavalry as a main military force. The horse was everything for a Scythe. They started riding horses when they were small children. Horses were not just transportation for Scythians; they were their protectors, providers and best friends. When a Scythian warrior died, his horse was buried with him. Scythian women were brave warriors as well. Living in the steppes was dangerous as you have literally nowhere to hide. Scythian women had to be strong and know how to protect themselves. Scythians did not have buildings. It does not make sense to build a house if you know that you are leaving soon. They lived in tents instead. The only buildings they left behind them were kurgans – artificial hills, made of stones and earth, elevated on top of the tombs of nobilities. These tombs were filled with everything that a person could need in the afterlife: clothes, dishes, weapons, golden jewellery. They cremated their dead by covering the body in wax. The favourite drink of Scythes was horse milk, often mixed with blood. They ate grains, fresh fruit, horse meat, and fish. Both men and women wore clothes that were comfortable for riding horse: leather pants and jackets, short soft boots tied at the ankle, and felt pointed hoods. Both men and women wore their hair long and loose, and men had beards. 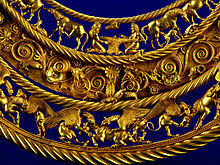 Scythians also liked to decorate their clothes, horses and weapons with golden jewellery. Since Scythes were very close to nature, the main motif of their jewellery was animals. 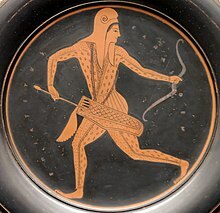 They loved to show animals in motion, because these images showed what Scythes valued most: strength, speed and freedom. Scythians did not develop any written form of their language. Though later, when they came in contact with other cultures, like the Greek colonies in the sea costs, they carved some texts in stones, but these were mostly for religious reasons and for the tombs. We don't know what their language was like and cannot read their writings. Their writing used the Greek alphabet with some modifications. Because the Scythians lived in constant danger, comradeship between warriors was important. Unrelated warriors swore an oath of blood brotherhood, after which they were committed to defending each other. Many Scythian mummies have been discovered in the Altai Mountains. When the Scythians buried their dead, they took care to provide the corpse with the essentials they thought they needed for the afterlife. They usually dug a deep hole and built a wooden structure at the bottom. For important people these resembled log cabins that were lined and floored with dark felt – the roofs were covered with layers of larch, birch bark and moss. Inside the tomb, the body was placed in a log trunk coffin, with some of their prized possessions and other objects. Outside the tomb chamber, they placed slaughtered horses, facing east. This page was last edited on 25 November 2018, at 04:18.